Nothing about this typewriter feels flimsy. When you strike a key, there’s a measured pace to the typebar. According to Olivetti, “the typebar movement is based on the principle of progressive acceleration.” Somehow it almost doesn’t feel mechanical, but more like an extension of your fingers. Other typewriters feel like they’re translating your energy to levers and joints and springs. You’re working the machine. Not so with the Studio 44, which has a softness to it, and seems to mute the actual mechanicals at work. After typing for awhile, you have the sensation that inside this machine are tendons and muscles and bone. There’s an addicting quality and a bond begins to form between human and machine. Isn’t that the goal of any artist’s tool, that it becomes one with it’s user? Rolling paper into the platen is smooth and quiet. The rollers on the paper scale are metal, and make light contact with the paper. The paper supports are a bit tricky to deploy. There’s two of them that require you to push down on the exposed part to get them to flip up. The margin stops are easy to slide into position. The carriage return lever is a two-piece construction. It hinges back for storing the typewriter in the case. The carriage return paddle is big, making it quite easy to use and find. If you do lots of typing you’ll appreciate how easy the carriage return works. It feels smooth in your fingers and after repeat use, carriage returns come naturally and easily. It seems like a lot went into the design of the carriage return paddle. Again, it reinforces Olivetti’s mission to combine design with function. It’s one of those small things the power user will appreciate after hundreds of pages of a manuscript. Typed characters come out bright, true and aligned. Olivetti claims the perfect alignment is because the carriage movement is comprised of a steel tube that glides over roller bearings. A quirky design element are the carriage release levers. The one on the left is low and flat, while the right one sits up high. The purpose of this is a bit puzzling. At first, you might think they perform different functions. But, this has been the same design since the Leterra 22. Overall, when it comes down to turning out page after page of manuscript, it’s hard not to fall in love with the Studio 44. It’s got the same great styling as the Lettera models, but with the solid feel of a standard desktop. Where would I find the serial number on my Olivetti Studio 44 typewriter? Move the carriage all the way to the left. The serial number is now visible, stamped on the 1/4 inch metal support. I have had Olivetti studio 44 for over 4 years and love it dearly, but with hearing you say that makes it so much better. Thank you. it is so great to know that people are using the typewriter that I use since i thought it was one that nobody liked. Hi. Looking for your opinion, as you have owned or tested out many different machines, I am currently using a Smith Corona Sterling, 1952. Nice machine, but it is an elite 12 pt font that is very small. I am looking for a bigger font like PICA or a 10 point Elite font on the Olympias. So I am looking at either an Olivetti Studio 44 or an Olympia SM9. Which would you suggest? 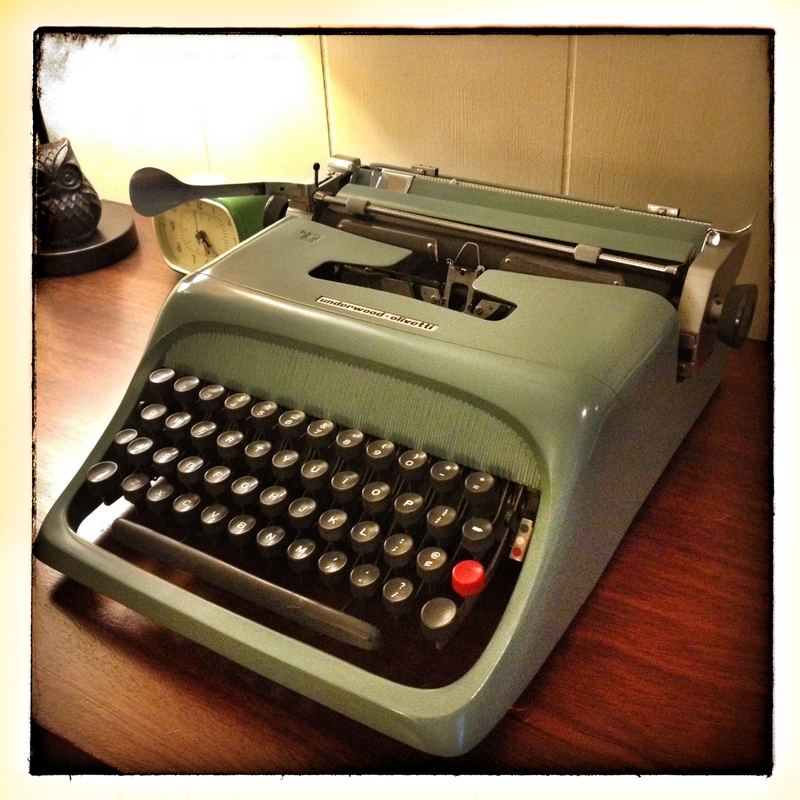 I am using it to write first drafts of novels, short stories, and maybe some scripts. What will hold up? What is a typer’s typewriter, and if possible can you tell me what each feels like or makes them different from each other? Can you compare the two to my SC Sterling. I believe you have reviewed it before. Thanks for your help. Big type and beautiful functioning – try the Olympia SM2 or SM3. My Dad bought one in the late 50’s and it’s still in use. This is a good assessment of a machine I never liked very much. It is true that nothing feels flimsy, to the point that I call it stiff. It’s hard to hate this machine though because they do print a clearer finished product than just about anything. Didn’t know about a distinctive carriage travel mechanism, that’s neat. I’ll have to look next time I see one because I sold mine. I have just acquired one of these through a family member.. is it still possible to purchase replacement ribbon? And what should i do in terms of maintenance before using it? Completely new to the world of typewritters. What does a typewritter like this one go for? Great news! You can still get ribbons. Here’s one I found on eBay. New ribbon! If that’s not up, search eBay for, “studio 44 ribbon”. Olivetti typewriters have a wider ribbon spindle than most, so standard or universal ribbons won’t work. As for maintenance, not much! If it types, you’re good to go! Resale varies, I’d say between $75-$150, depending on condition. You can always search eBay or Etsy to see what they’re selling for. Thats great thank you very much for the info! It appears that I’ve really lucked out on mine. A friend found my Studio 44 at a thrift store, in mint condition, for only $20 with the case. I am astounded by this. I have sixteen typewriters, and they never look this good. I’m having a little trouble getting the E and A keys to print properly. Not sure why, but it feels like they’re a little sluggish. Gotta really hit them to get the printing curious about this ball bearing system you speak of. My has a slight lag when I push the carriage across. Gunked up maybe ? Has anyone done a proper disassembly on one of these ? This is my first Olivetti and I’m eager to see how it works. Living in the southern US I never excepted to see one anytime soon. Incidentally, my serial is 498505. I got my Studio 44 for R40 at a bootsale, and the guy had 2……why did I not take both!!? A steal indeed! One is good. Keep it simple. Hopefully, the other falls into the hands of another writer. I still stand by my original review. The Studio 44 is an under-appreciated performer! Plus, you can usually find one cheap! What was the average price of this typewriter when it came out in 1965? I found ano Olivetti studio 44 made in spain. I am unable to research serial number to obtain the date. Any ideas? I reckon the larger carriage release lever on the right is perfectly formed like that so when you hold it between and thumb and you can release and move the carriage back and forth. The sweet little curl of the lip lets you do that – I call it a Mona Lisa touch. Whilst when I use the gloriously sensual curves of the carriage return, I think I’m holding Sophia Loren. How right you are! I pulled mine out and, indeed, the release lever on the right is formed just right for easy carriage positioning. And that big paddle on the return lever — well, blush — I have to say Jim, you’re making me reevaluate whether I should be moderating these comments. smile. My Studio 44 does not have a serial number in the place where you said it would be. Is there any other place inside it that the serial number might be at? 999038 Olivetti studio 44 green. How old is mine? I have a Olivetti Studio 44 sn:596276 made in Italy that I inherited from my grandfather. It is in perfect condition with suitcase, brush, cloth and plastic cover and a service sertificate from 1968. How can I find out how old it is? I checked on typewriterdatabase.com but had no luck. Please can some one help. Looks like 1963-65. Up to 599576 in 1965. There’s some question marks next to 1963-64. The serial number on my Olivetti Studio 54 is 628555. Can you tell me how old my machine is? A quick check of the Typewriter Database puts it 1965-66. Hi my serial number for olivetti studio 44 is 1012361 , i cannot find the year made anywhere. How much does the Studio 44 weigh?